Orexin-A and Orexin-B (also known as hypocretin 1 and 2) are, respectively, 33- and 28-amino acid residue peptides that activate a G-protein-coupled ‘orphan’ receptor, i.e. which has no known ligand. (1) Immuno-cytochemical studies show that orexin-positive neurons are located in the lateral hypothalamic area and arcuate and perifornical nuclei. (2) They are also found in various sites beyond the hypothalamus such as the thalamic paraventricular and reuniens nuclei, locus coeruleus, nucleus of the solitary tract, raphe and septal nuclei. The hypothalamus has a major role in regulating various behaviours that contribute to homeostasis (such as arousal, feeding, and thermoregulation) by integrating external and internal stimuli. (3) It is involved in the regulation of nutritional status via the co-ordination of many neurotransmitter systems implicated in food intake and energy expenditure.4 The hypothalamic orexin system directly and strongly innervates and potently excites noradrenergic, dopaminergic, serotonergic, histaminergic and cholinergic neurons. (5) Orexin also has a major role in modulating the release of glutamate and other amino acid transmitters. (4) This widespread distribution and effect of orexin on multiple neurotransmitters suggests that it may be implicated in functions other than feeding, viz. other vegetative and neuroendocrine regulations or those related to general arousal states. 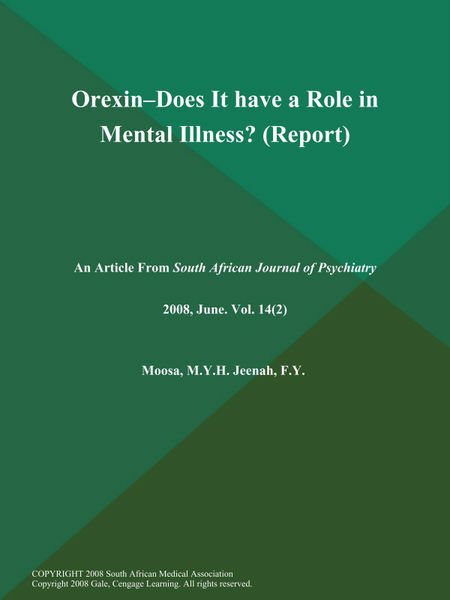 Illness, Mental, OrexinDoes, Report, Role permalink.